Inhabitat has reported on some pretty mind-boggling designs by the Bjark Ingels Group, but their latest winning proposal just may take the cake. BIG’s Energy Valley was recently chosen as the master plan for Stockholmsporten, a new entrance and major highway junction planned for Stockholm. The group worked with Grontmij and Seascape to create a sculpted bowl-shaped valley that connects the surrounding neighborhoods while improving the largest infrastructure project in Sweden. We’re loving the smart, pedestrian-friendly design for the junction, but plans for a giant reflective sphere to hover above the valley have us scratching our heads. Designs were solicited to create a new “entrance portal” into Stockholm at an intersection about 15 km north of the city where two major European highways, E18 and E4, converge. An update to the intersection, which is known as the Hjulsta, has been discussed for decades, as the major roadway is a hot spot for accidents. Plus, it creates a barrier between the residential neighborhoods on one side and a recreation area, Järvafältet, on the other. Previous plans to upgrade the junction would have divided the surrounding neighborhoods into four areas and created more barriers between them. BIG‘s plan reconnects the areas while allowing for improved roads. The excess dirt that is excavated to create new tunnels and infrastructure will be used to create a gently sloping valley that will surround the highways. The circular peak will be topped with pedestrian and bicycle paths for easy transport between neighborhoods. Natural vegetation, wetlands, and pine and oak trees will be planted as landscaping inside the valley to reduce noise and air pollution from the highways, while also making the promenade an enjoyable place. The pedestrian loop and valley ridge will align with public spaces within the surrounding towns, including a shopping center, a sports complex, and a mosque. Towns also have room to expand up to the edge of the ridge. 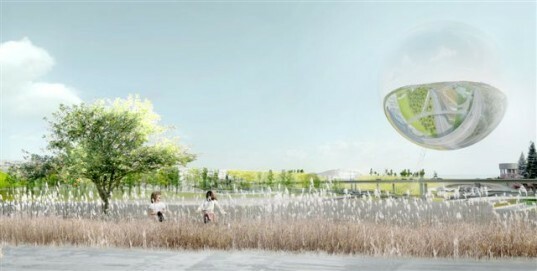 Floating over top of the valley and highways will be the supposedly self-sustaining disco ball-like sphere. The press release says that 30 percent of its surface will be covered in solar panels, which will power the sphere, allowing it to hover while also supplying 235 houses with power. 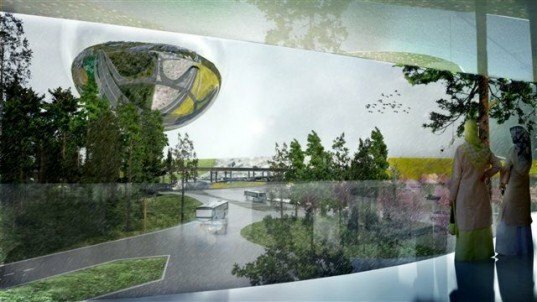 The mirrored bottom is meant to be a work of art that gives drivers a 180 degree view of the surrounding area. There is no information available about the size of the sphere or the technology that will allow it to float. While the valley design makes perfect sense to us — we like the idea of re-using the earth dug up during construction to create a more pedestrian and bike-friendly junction — we’re a little bit lost on the purpose of the floating sphere. Perhaps its just the lack of details, but it seems like it is an unnecessary use of materials tacked on to a perfectly smart design. Those photos were really great. I haven't seen those images before. I think they will catch the attention of the viewers. And I am sure , many will amazed on this unique arts. Inhabitat has reported on some pretty mind-boggling designs by the Bjark Ingels Group, but their latest winning proposal just may take the cake. BIG's Energy Valley was recently chosen as the master plan for Stockholmsporten, a new entrance and major highway junction planned for Stockholm. The group worked with Grontmij and Seascape to create a sculpted bowl-shaped valley that connects the surrounding neighborhoods while improving the largest infrastructure project in Sweden. 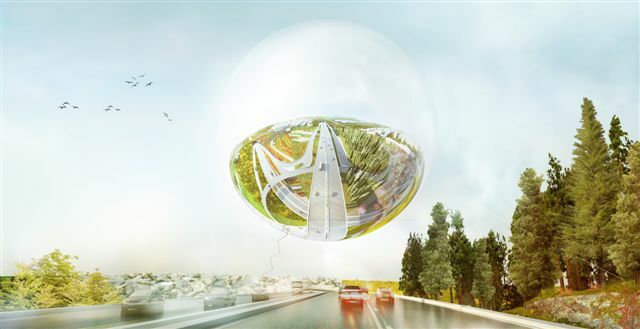 We're loving the smart, pedestrian-friendly design for the junction, but plans for a giant reflective sphere to hover above the valley have us scratching our heads.